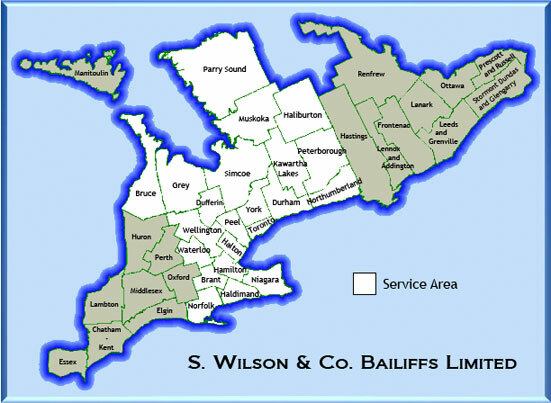 S. Wilson & Company Bailiffs Limited and Barton & Company (Bailiffs) Limited offer an experienced team of Bailiffs all bonded and provincially appointed under the Bailiffs Act of Ontario. We are one of the largest Bailiff operations in the Province of Ontario, specializing in commercial tenancy matters, municipal services, asset recovery, chattel mortgage services, inventory & appraisal services, liquidation by auction or sale. We provide storage facilities, property management services, skip tracing & process serving. The Bailiffs Act, The Municipal Act, the City of Toronto Act, the Costs of Distress Act, The Commercial Tenancies Act, The Repair and Storage Liens Act and The Personal Property Security Act.